arkitekt vandringer: I did it ! 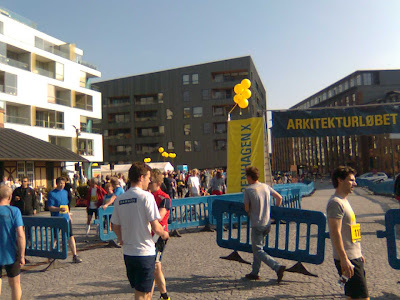 Just came back from the architecture run through Østerbro: 6km running between buildings, to use the saying Gehl architects had printed on their team's t-shirts. The concept: proposing a run for sportive citizens (there are as many diffrent organised runs in Copenhagen as there are summer festivals of all kind - to give you an idea) during which the participants pass recent projects, buildings and urban spaces. Hereby they discover a city part and its dynamic development, they become aware of what is happening in their neighbourhood. When I say discover, I mean it and we didn't jus pass some projects: the route took us THROUGH buildings, halls, gardens, backyards, up and down stairs, over the roads and railways, along the dockside... I would have been surprised if we had to plunge in the water or jump from boat to boat. At the end, water, fruit, energy bars, beer and grilled sausages (on that point an alternative for vegetarians would have been nice), an architecture guide for everyone...and a really nice jazz band setting the atmosphere for a good evening on the docks of Nordhavn. It was a very fun run! I hope I'll be there to do it next year!